I’ve decided that I’m going to write several blogs on the tools that I find indispensable. you’re a programmer or a knowledge worker you likely get inundated with email. I use Microsoft Outlook (I think we all do), and while it has some organizational features… it needs help. In come the SimplyFile add in from Techhit. We all likely get several emails per day, some we care about, some we don’t. Some we’ll care about later… the biggest challenge for me, is organizing them. I’ve gone back and forth between using folders and using categories (Look for the upcoming post on SimplyTag). SimplyFile will add a new section to your Outlook Ribbon (Displayed below) that will allow you to quickly file messages right from your inbox . 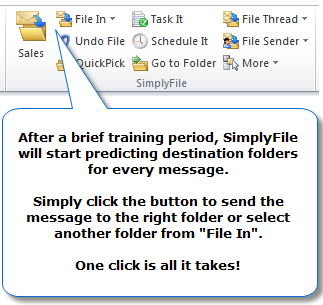 SimplyFile will learn over time and begin suggesting the folder to file in based your habits. It really excels at this… especially with those of us who have tons of folders in our inbox. For a complete list of the features check out TechHit’s SimplyFile page. This small tool has saved me hours making it so easy to keep my inbox clean. SimplyFile is one of the first applications that I install on my computer because, to me, it is essential. The best thing that I could possibly say about the company is that they actually listen to feedback… I was on the beta of SimplyTag (Similar to SimplyFile, but uses categories instead of folders) and sent some feedback… the feature I asked for, was added and included in the initial release!